Soon afterward, he was approached by director Gavin Elder with the new studio’s very first project: supervising the entire production and post production workflow on a concert film featuring none other than Pink Floyd Guitarist, David Gilmour. To find out more, we spoke to Tonkin about the journey he went on with the David Gilmour project, and how he put the new Hangman facilities workflow - which was centered on DaVinci Resolve Studio - to the test. This sounds like an incredible film to become involved in! What was it like to be in Pompeii with David Gilmour? Amazing, but not without its challenges! I was fortunate enough to work across the entire production, shooting all aspects of the show, including two days of live performances in Pompeii. There were more than 19 different camera positions, shooting a range of different resolutions and codecs including ProRes, XAVC and CinemaDNG RAW. Camera’s in use on the production included the Sony F55, Sony A7RII, RED Dragon in 6K as well as an URSA Mini 4.6K and DJI Drone. Shooting the mix of resolutions, and the fact that we shot in RAW, meant we had to work with large amounts of data in post. My main aim was to set up a simple, yet efficient workflow for dealing with both the number of cameras and the many different formats that we used across the two days of filming to simplify the edit and grade. What were you trying to achieve with the grade? The main direction on the grade was to be as faithful to the look of the live concert, retaining the feeling of what occurred on the night. Hence, the grade was mostly corrective, matching up the different camera types as well as correcting any issues with lighting, angles or camera settings. We wanted a clean yet filmic grade which would complement the high quality of the musicianship and live performances. David Gilmour is renowned for exceptionally high-end audio production, so the images had to match this standard. What were the key challenges you came across? The hardest part of completing the grade was matching 19 different sources, whether that was inconsistencies in lighting, or simply the angle of the shot. For example, identically matched cameras with the same lens could look completely different simply due to how the Amphitheater was lit; the look would change depending on where the cameras were positioned or the amount of smoke on stage. It was also a theatrically lit concert with extremes of contrast ratios and light which proved to be a challenge. How did you tackle this? Every morning, often four hours before the director would come in, I’d work on the chosen song for the day and match cameras in Resolve using mostly primaries. I prefer, especially on concert grades, to keep things simple to start with and not get carried away with creating too many nodes and breaking up the shots with multiple secondaries from the outset. You can often get 200-300 shots per song so it can quickly get out of hand if you get too carried away at the beginning. What tools did you find most useful throughout your work on this project? DaVinci Resolve has excellent timeline management tools which are invaluable on concert grades such as these. One of the most useful timeline filters is being able to select ‘Common Media Pool Source’ which allows you to view all the same camera angles quickly within a 300 shot timeline. Using a combination of remote and local grading allowed me to set up a song with look rippling across the same angles, then break it up to work individually on every shot. 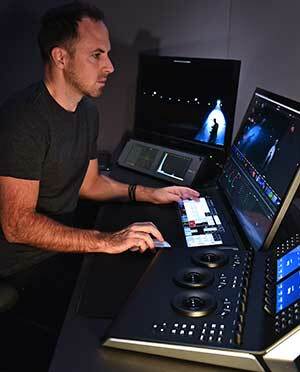 You purchased a set of the Resolve Mini Panels for the new suite, how have you found the experience so far? The Resolve Mini Panel came out at just the right time for us as we were about to commence the grade on David Gilmour’s Pompeii film. Having the tactile control of the panels is essential, and it quickly became muscle memory, allowing me to intuitively grade. With such a long concert film to grade and with so many cuts and cameras to work with on each song, it can become very, very repetitive and that is why you need software and hardware to work seamlessly. When they do, it makes the process of working through long timelines quick and creative. When you have a client attending and wanting to see changes instantly there is no time to be hunting through menus or endlessly clicking, they expect to look at changes they've asked for to occur immediately, and that is the strength of having the Resolve Mini Panels in the suite. And what resolution and codec did you deliver to? Everything was rendered to ProRes 4444. We delivered multiple different versions from 4K-DCI, 4K UHD and HD. We also created a cut down version for television as well as DVD and cinema versions, both in 4K and HD. Now that you’ve completed work on Live at Pompeii, what are your plans for the future with Hangman? Top of our list was to be able to offer newly designed dedicated rooms for grading and finishing as well as surround sound audio mixing and composition; hence soundproofed suites with controlled lighting as well as optimised viewing and listening distances. As a newly designed 4K finishing facility, I believe it’s our responsibility to minimise all the potential workflow issues and just offer up the most creative solutions to our clients at the end of the day. What we can creatively achieve at Hangman is the goal, and I don’t believe clients or producers should have to get caught up with worrying about whether finishing costs will go up because they’ve shot in RAW or 8K.